That’s a question I asked myself often when I first moved here. I still vividly remember how I felt when I saw all the old neighborhoods, full of old houses with such character and style. The neighborhoods felt almost magical. I’d heard the terms bungalow, craftsman, and tudor before, but I wasn’t really quite sure how to differentiate them. After living here for awhile, I got familiar with those terms and a gained basic understanding of the styles of homes that fill our neighborhoods. It wasn’t, however, until I met Eric Wheeler of Positively Portland Walking Tours, that I began to grasp all the subtleties and details of all the varying architectural styles here in Portland. I’ve also come to appreciate how some styles are even unique to Portland. So, I’m starting to send Eric a series of photos of homes in Portland and asking him to answer some basic questions about each house to share on this blog. The pictured house is a single story “Portland Bungalow”, built in 1928 in a high-density residential district in SE Portland. Typically houses of this style have 2 bedrooms, one bath, full basement and less than 1000 sq ft of living area. This modest house type was very popular with builders and buyers in the “between the wars” period of the 1920s because of its ease of construction and affordability. The small footprint of the house also fit in well in subdivisions with 50 foot wide lots in the “streetcar” neighborhoods on the east side of the Willamette River. Like many bungalows of this time period this house has Craftsman-influenced clipped gable ends (also called “jerkingheads”) on each side of the main roof and at the top of the porch roof. The multi-paned transom window over the picture window on the left side of the house is another Craftsman element in the Portland Bungalow. But unlike true “Craftsman Bungalows” built in the first three decades of the 20th century, the Portland Bungalow has a wide front with a rectangular foot print parallel to the street, as opposed to most Craftsman bungalows that have a narrow front with a rectangular foot print perpendicular to the street. The central entry and evenly spaced windows of this house type are more typical of Cape Cod or Colonial Style houses. 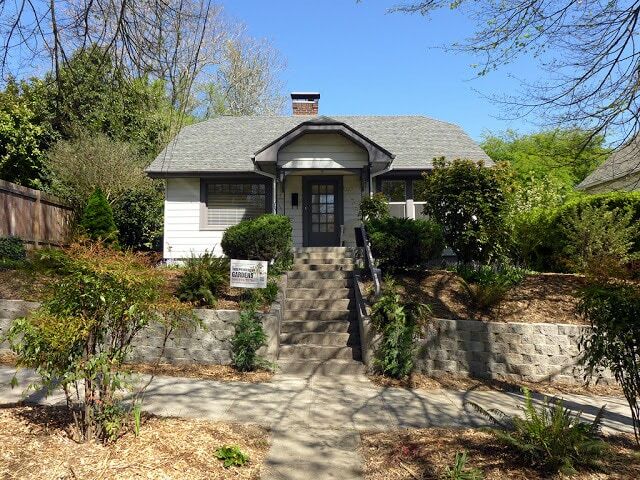 Because of key differences in appearance and floor plan and the popularity of this style in the early 20th century Portland streetcar neighborhoods, many in the real estate profession are calling this house type a “Portland Bungalow”. Look for this modest, but charming residential style as you walk, drive or bike around old Portland neighborhoods. What type of house will we discover next?